What if advertising were dead? Really? 1. Most people claim to dislike advertising on the web. I know, display advertising is probably despised more than less flamboyant search ads. But in my recent survey, 71.4% of the respondents who don’t work in marketing claim that they never or rarely look at the sponsored search ads on Google or Bing. (Interestingly enough, even 31.6% of the people who do work in marketing made the same claim.) Many participants identified the words “annoying,” “distracting,” and “untrustworthy” to describe how they feel about the ads. 2. Some gurus claim that social media marketing will supersede advertising. Instead of spending money on advertising, they advise marketers to invest in blog posts for SEO rankings, catchy YouTube videos, the nurturing of fan pages on Facebook, and so on. Some go so far as to suggest eliminating advertising entirely (PPC bad, SEO good). 3. Almost all of the social media platforms are advertising supported. The only reason there is a Google search in which SEO can thrive is because advertisers foot the bill for essentially all of Google’s infrastructure, operations, R&D. Similarly, YouTube and Facebook — largely funded by investors so far — all expect to cover the majority of theirs costs by selling ads. Even Twitter can’t avoid revenue forever, and advertising remains a likely mechanism. Given those premises, how can you not conclude that the Internet as we know it is doomed to fail? In other words, if social media marketing really succeeds at banishing advertising, then there will be no media in which to socially market anymore. Not possible, you say? Economically, it’s actually quite rational. Why would anyone pay to advertise when most people ignore ads and that investment is “obviously” better spent on producing social media content and conversations? And why would for-profit companies run these social platforms if they can’t generate any revenue? What are the possible outs? Users start paying for services directly. You can use Google, but you have to pay $15/month. Same goes for pretty much every web site or service that is advertising supported today. There’s some talk that Apple’s AppStore for the iPhone has proven that this model can work. Although, I know quite a few app developers, and none of them seem to be making all that much money. Certainly the big media folks tried that road — e.g., online subscriptions to The New York Times — and it didn’t end well for them. The web platforms sell their profiles of everyone. Google, Facebook, YouTube, etc., track everything you do, and then they sell that information to the highest bidder. Marketers won’t directly advertise on those system — no one pays attention to the ads, right? — but they will use this information for trying to target you in other channels, or for market research, or for, I don’t know, outright blackmail. Seriously though, is the relinquishing of everyone’s privacy worth the incremental value it could give marketers? Is there even enough value there for the marketers to cover the expenses of the platforms? Government or NGO’s take over the platforms. Hey, it works for Wikipedia. Theoretically, I suppose Google, YouTube, Twitter, Facebook, etc., could be funded by tax dollars or donations. Maybe that’s the ultimate egalitarian computing society of the future. But realistically, it’s hard to imagine. Have you seen the health care debate here in the US lately? Yikes. I have a hard enough time getting someone from Google to respond to my emails already. Advertising isn’t really going to die. As Mark Twain famously remarked, “The reports of my death are greatly exaggerated.” Even if they won’t admit it, maybe enough people find advertising relevant in enough circumstances — consciously or unconsciously — that it is in the economic interest of advertisers to continue. Maybe those social media gurus are incorrect in their predictions that social media will replace advertising — maybe it will end up complementing it instead. Maybe, in a strange way, the dynamics of social media marketing, as it matures, will be closer to advertising than those gurus might like to imagine. Honestly, I think a lot of advertising today is not very good, and the negativity and backlash it’s generated is reasonably justified. However, I also believe that advertising can and will evolve. It needs to become more useful, taking a place in the world where people can generally appreciate it and not despise it. Yeah, I know, that sounds like a stretch. But not nearly as much of a stretch as the alternatives. I don’t think it’s an easy mission. 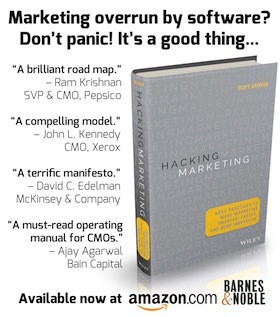 But it’s the mission that I think marketers and marketing technologists must tackle. The survival of the web just might depend on it. Are there any studies of what people actually do and how they are actually influenced as opposed to what they say they do? There is a large body of research showing that we are not actually very good at introspecting how we make decisions and what influences us. Advertisers are well aware of this. And someone is clicking on all those PPC adds. In anyc ase, the operating rule needs to be that every time you touch a lead-prospect-customer you need to add value for them. Value of course can take many forms. If you make me smile you have provided value. I suspect people’s opposition to ads of all kinds and especially PPC is greatly overstated. I think you’re right to a degree: people’s dissatisfaction with advertising is probably overstated. Or, more accurately, how they behave with advertising is different than what they think or say about advertising. However, I do think this is having a real impact. It’s one of the contributing factors — maybe even the primary contributing factor — as to why display advertising metrics are going the wrong way. Even search ad PPC rates have been declining. Meanwhile, the drumbeat for engaging in social media marketing continues to grow louder. Given that marketers have finite resources — bounded as much by their time as their budgets — one can see a shift from advertising to socializing. However, as that happens, it seems that (a) getting attention in social media will become harder to do, as there will be more competition, and (b) revenue of social platforms — can I call Google a kind of social platform? — will suffer. I think those system dynamics could be a bad bump for both marketing and the Internet. At least that’s on possible theory.